I wish I had a review here for you, but the USPS delivered a battered, empty envelope to my house last week. Not sure what happened on its way to me, but I will get a replacement copy to review soon! I wanted to get this post up asap so I can give away a copy to one of you, as well! Here is a little more about this book - I can't wait to get my hands on it! I am excited to introduce you to blogger-turned-author Kay Willis Wyma. Kay asks an important question: Is comparison-living hijacking your life? Tired of performing? Feeling weighed down by the pressure to be Pinteresting? Does your friend’s wardrobe, body, marriage, paycheck, vacation plans, or photoshoot-worthy home décor leave you wishing your life looked more like that? The book title says it all!! 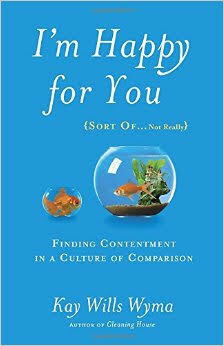 Our cultural obsession with comparison is undercutting relationships and sapping contentment. With disarming candor and humor, Kay Wills Wyma explores how to trade comparison for compassion and rediscover what life is all about. It’s easy to get caught in the comparison games we play with our appearances, our kids, and our homes. Kay reminds exhausted families about tried and true remedies from the pressures of competitive living. 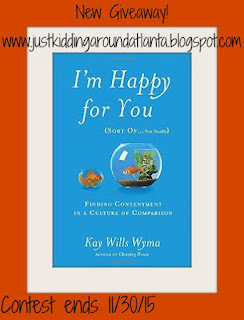 In her warm, relatable style, Kay confronts the comparison epidemic raging in our homes, our neighborhoods, and our social-media feeds, offering remedies along the way. Kay Wills Wyma is a blogger, mother of five, and the author of Cleaning House through which she has appeared on The TODAY Show, CNN, Glenn Beck, The New York Times, Focus on the Family, and more. Before becoming a stay-at-home mom, she held positions at the White House, the Staubach Company, and Bank of America. Kay lives in the Dallas area with her husband, Jon, and their family. Join Kay and her family as she’s started to #HydrateForTheHolidays on her blog posts to learn how to recapture contentment and joy, especially in Nov. & Dec.!! She’ll be sharing thoughts throughout the season! You can enter to win a copy of I’m Happy For You (Sort Of…Not Really) through the Rafflecopter widget below. Make sure you complete the mandatory entries first - otherwise no other entries count. I will be receiving a copy for review purposes but no other compensation was received. Only one entrant per mailing address, per giveaway. If you have won a prize from sponsor FlyBy Promotions in the last 30 days, you are not eligible to win. If you have won the same prize on another blog, you are not eligible to win it again. Winner is subject to eligibility verification. I've been wanting to check this book out - I really enjoyed her previous book "Cleaning House"! My biggest stress this time of year is trying to keep up with the kid's schedules - every day is something special at school and every night there is some event they want to attend! For me the stress this year is trying to pull off a normal looking Christmas with a very tiny budget. I had to take a couple months off work due to a sick family memeber and we just can't seem to get back on track. My stress is the expectation of being at so many events! It stresses me out! I try to decline the ones I can - but there's still so many. My biggest problem is trying to just LET IT GO. You know, all of those little irritations that happen a hundred times a day. I used to be really good at it- I'm not sure just what happened! I have a hard time saying "no" when asked to help with things I know I don't have time for.